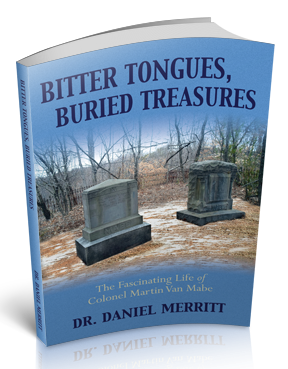 For those desiring a copy of this award winning book can request one by emailing: asurefoundationdrdan@yahoo.com or writing to: Daniel Merritt, 109 North Street, State Road, NC 28676. The cost of the book is $15, which includes postage and handling. Dr. Daniel Merritt has been a Southern Baptist pastor since 1971. He is a graduate of Campbell University, Southeastern Baptist Theological Seminary and Northwestern Theological Seminary. This is Dr. Merritt’s sixth book. His writings have not only sought to expound deep theological truths, but he has been an passionate writer in preserving Baptist history and Christian heritage. Several of his books have won acclaim for their excellence by the North Carolina Baptist State Convention and the North Carolina Society of Historians. In addition to his pastoral ministry and love for writing, Dr. Merritt has for many years been a seminary extension instructor. He lives with his wife, Shirley, in the foothills of North Carolina. Bitter Tongues, Buried Treasures is the story of the fascinating and colorful life of Colonel Martin Van Mabe. Born in Stokes County, North Carolina in 1838, Mabe’s grandfather was a Revolutionary War veteran and his grandmother of Cherokee descent. Entering the Civil War he fought bravely on the battlefield and with courage endured being a POW in a Union prison camp. Returning to Stokes County after the war, he became one of the most successful and prosperous businessmen in the county. His influence was felt statewide. Never marrying, he hired his first cousin, Nancy Jane Mabe, to be his housekeeper. Neighbors and kinsman became jealous of his success and spread vicious rumors that Martin and Nancy Jane were “living in sin.” They even had to go to court to prove the charges false. Nancy Jane vowed that none of her neighbors and relatives would at her death inherit any of her possessions. What she chose to do to keep that from taking place the reader will find most intriguing. Is the Bible really the inspired Word of God or just a product of man’s ingenuity or superstition? Is there a way to prove the Bible is truly not of this world but instead possessing a divine origin? In A Sure Foundation: Eight Truths Affirming the Bible’s Divine Inspiration, author Daniel Merritt seeks to answer those questions. Using the experience of more than 40 years in ministry, Merritt instills in readers confidence as to the truthfulness of God’s Word. He also provides information that will allow them to defend the Bible against attacks by unbelievers. To the honest inquirer, A Sure Foundation presents rational arguments that the Bible is more than an ordinary book—that it was authored by a divine mind. 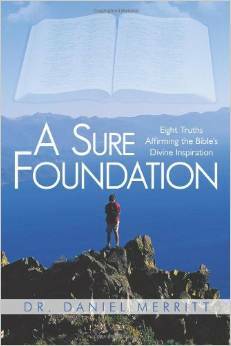 A Sure Foundation: Eight Truths Affirming the Bible’s Divine Inspiration seeks to help both Christians and non-Christians. You may find your faith immediately reaffirmed, or you may be set on the path that will lead you to the truth. When studying Scriptures, questions often arise that encourage reflection and prayer among students of the Bible. But the grace-filled story found in John 7:53-8:11 of the woman caught in adultery seems to demand more answers as there are many textual critics who see the dramatic account as having a problematic history th at raises the question whether the verses represent an authentic narrative from the pen of the Apostle John based on an eyewitness occurrence or a later insertion by an unknown scribe after John’s death—an inauthentic story attributed to Jesus. In his comprehensive study of this controversial passage, author Daniel Merritt seeks to answer questions and offer reasonable arguments for the authenticity of the narrative to John, its present location in the Bible, and its original location in the fourth gospel. As he examines and discusses eight evidences to support his conclusion, Merritt delves into the text, early manuscripts and church councils, style and theology, considering whether the book meets the test of inspiration and canonicity. 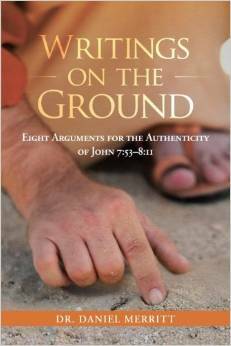 Writings on the Ground shares eight thoroughly researched arguments for both the layperson and the serious Bible student who seek a better understanding of John 7:53–8:11. Pastoring and organizing dozens of churches in the North Carolina foothills, he was a much in demand speaker. According to a diary he kept, during his ministry Brown traveled, mostly on horseback, over 88,000 miles preaching the Gospel, preached over 7,000 sermons, and baptized over 3,000 converts. The father of seven children, three became preachers, others became involved in North Carolina politics, teachers and other prominent positions in society. Dying in 1901, at age 81, he was much responsible for the spread of most of the Baptist churches in the western North Carolina foothills. His life is a remarkable testimony what the Lord can do with a life yielded to Him. 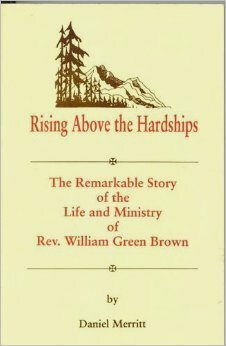 Brown had a lot of hardships in his life but with the Lord’s hand upon his life he overcame them and lived a remarkable life that has no other explanation than that the Lord did it. Rising Above the Hardships was recognized by the North Carolina Historical Society for helping preserve Baptist history from the 19th century. For those desiring a copy of this award winning book can request one by emailing: asurefoundationdrdan@yahoo.com or writing to: Daniel Merritt, 109 North Street, State Road, NC 28676. The cost of the book is $15, which includes postage and handling. I would very much like a copy of the book . I just found out the rev was my great great great grandfather.